"Join us for lots of fun and great shopping.. we will have: All things girly, painted glassware, Vintage decor, Shabby -Chic furniture, Harvest and Holiday Decorations, BLING, Handbags, Children's clothing, Artisan Soaps and lotions, Spirit wear. Coffee will be provided in the morning and lunch will be available for purchase in the afternoon in the food court." Admission is a Canned food donation. They are partnering with Communites in Schools( CIS) to help restock the food pantry. "This is a well established crafters' bazaar in its 33rd year. Approximately 60 vendors display quality products. The venue includes shopping, a lunch café, a large bake sale, and a coffee bar for taking a break from the shopping." "Come and join us for the fall show of Petticoats on the Prairie-The Premier Vintage Market of West Texas! 2 days of shopping magic at the Mallet Event Center on October 16-17th 2015. 80+ hand-picked vendors with vintage and repurposed items, antiques, clothing, architectural salvage, jewelry, furniture, handmade goods, jewelry and cool JUNK too! Come see the vintage trailers from Sisters on the Fly also! " "Gifts for everyone on your list at this outdoor farm venue featuring two dozen local artisans - leather, weaving, candles, jewelry, photography, knitting, fiber arts, rustic art, and more. Lunch available for purchase. Kids make-and-take activities. Farm animals up close. Professional storytelling and guest musicians--the Metroplex United Pipe and Drum Band." "This is a fun, family event. It will be held in the parking lot of Dark Hour Haunted House. There will be several rescue groups with dogs and cats available for adoption. Also, we will have vendors, concessions, a bake sale, games with prizes, a Tarot Card reader, balloon artist, face painter, and crafts for the kids. There will also be a costume contest for dogs and Wag Photography will be there to take pictures of pets." 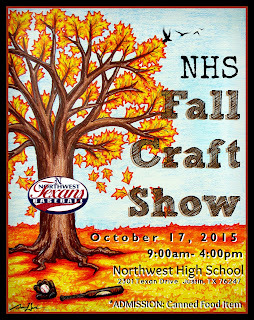 "Birdville HS in North Richland Hills Annual Craft Show! Come out to support the local PTSA while supporting local artisans and family owned businesses! Indoor shopping and family fun! Entry is just a $1 donation toward BHS Senior Project Celebration." Precinct Line and Mid Cities Blvd. "The buildings will be filled with Christmas crafts, gifts for kids, scrapbooking supplies, hand-crafted jewelry, home decor, gourmet foods, stained glass and glass art... and much, much more! You're sure to find the perfect Christmas gifts for your friends and family - and maybe even for yourself! There will also be a bake sale, gift raffle and pumpkin patch throughout the day! Entry is free, come and enjoy!" "5K race & huge, outdoor vendor fair with almost 200 booth spaces that are filling up quick! We expect 2,000+ in foot traffic. Entertainment and food vendors on-site as well! Last day for Early Registration discount is October 2nd, don't miss it!" "Bounce houses, slides, rock climbing wall, trackless train, game trailer, face painter, hay rides, vendors, food trucks and much more. The event is free and open to the public. Visit facebook.com/phillipscreekranch for more information." "Each year St. Patrick Catholic School of Dallas, a nationally recognized Blue Ribbon school, holds an annual carnival - Harvest Fest. The 2015 Harvest Fest will take place Saturday, October 17th. This fun family event will feature inflatable slides & bounce houses, zip lining, silly string wars, face painting, laser tag, food vendors and more! This year, we are also introducing our Harvest Fest Market Place which will spotlight local vendors. "